It’s common knowledge that if you want to be successful at anything you need people to know who you are. In business, this is vital because it’s how you promote your brand and attract people to your company. Marketing and advertising are key in the corporate world. So much so that even a poor product can be sold if the marketing is good enough. That should give you some indicator of why companies spend so much money and resources in marketing. The key is to get the perfect combination of both online and offline marketing strategies. If you can cover your bases with these things, you’re going to find a much better success rate. It’s easy to think that the internet is the be all and end all when doing business. But this really isn’t the case. There are benefits to using more traditional methods of advertising alongside digital forms. The perfect approach to take is to use a mixture of both to really catapult your business into the public eye. Of course, as a business you’ll no doubt be aware that everything these days seems to be digital. The internet has taken over the world, and there isn’t a lot we can do that doesn’t involve computers. When it comes to business, you need to use the internet and computers to run your company. Things like social media and search engines have transformed the way we’re able to do business. So when it comes to marketing, it’s only natural to use as many online resources as possible. WordPress web design, blogs and Twitter accounts are perfect for connecting with the highest volume of people. Using online marketing techniques, you can reach a global audience twenty-four seven. You’ll also be able to grow, adapt and evolve. The internet allows you to keep the business fresh, current and interesting at all times. Just because we live in an era dominated by technology doesn’t mean that’s all there is. There are important marketing strategies you need to think about using that don’t involve the internet. Think about old school business advertising, and what companies did pre-internet. Of course, there was television, radio and newspapers, as there still is now. So you might think about targeting those as you can have a lot of success that way. It’s also important to consider word of mouth advertising and face to face interaction. Offline marketing techniques are as important as online ones. They allow you to target people local to you, and they make things a little more personal. Another huge benefit is that they don’t rely on machines and technology. If your computers and software crashed, you’d still be able to advertise. 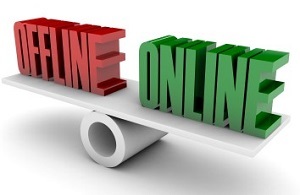 As you can see, there are a lot of advantages to using either offline or online marketing. And that’s why the best idea is to go for a combination of the two. This way you’re going to be able to help promote the business on a global scale, and continue to evolve. Offline Marketing and its strategies are still alive because it helps to communicate to the customers and to build relationships more effectively.